Jeffrey D. Brauer was retained to provide a long term master plan for both courses, including a business and operations review. After reviewing each course in detail, we proposed one remain in the affordable category, while Washoe try to upgrade to upscale public to offer county residents differing options. Washoe Golf Course was originally designed by a former associate of Alistair McKenzie and has more inherent charm, including some views of downtown Reno. We proposed a complete renovation when funds became available, in addition to minor upgrades while they got funds together. We viewed Sierra Sage as being in the right market, and proposed a long term plan of various infrastructure and agronomic upgrades to keep it competitive in the market. Tuckaway is the former home of the Greater Milwaukee Open from 1972-1993, well known as one of the best clubs in the state. It is also known for its large, fast, and undulating greens, narrow tree lined fairways and plethora of strategically placed sand bunkers. It was the very first 18 hole design of my mentors Killian and Nugent, begun in 1964 and opened in 1968. We were retained as a protégé of the firm who could and would be sympathetic to the original design, which is considered a classic of mid 60’s Chicago School design. We used our systematic design process, including regular club meetings, to create a long range plan implemented over nine years. However, when brought to a vote, the committee shortened the plan to three years to reap economies of scale and minimal disruption in terms of years, not areas. Improvements will be implemented in priority order, starting with an expanded irrigation pond and totally new, state of the art irrigation system. Cart paths and major drainage should be added in the second year of construction, with sand bunker improvement coming in year three after all required infrastructure to support better bunkers is in place. Late 20th century and early 21st century designs somewhat overdid sand bunkering, whether to win awards or sell adjacent real estate. Golf’s new reality is that those houses have been sold, play is down, and cost cutting is usually necessary and never a bad idea. Like anything else, it can be done well or done poorly, and utilizing a golf course designer who can consider aesthetics, strategy, circulation, drainage and more makes it more likely to be done well, without affecting the integrity of the golf course. 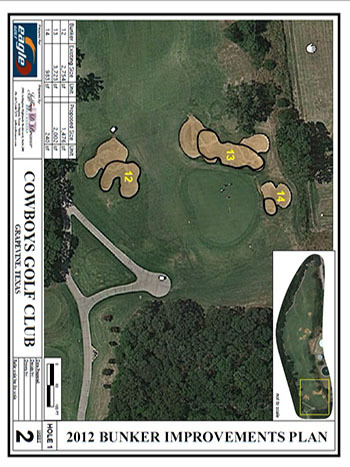 Jeffrey D. Brauer has reviewed dozens of courses – including his earlier designs – and found that it is possible to remove 10-25% of sand bunkers, reducing maintenance costs, speeding play on public courses, and sometimes, generally improving aesthetics by making the green the main focus of the golfer’s eye. Daling Lake was one of our Chinese projects that was abruptly cancelled by the government when it made golf illegal. There is some hope the ban will be lifted, and projects resumed soon. 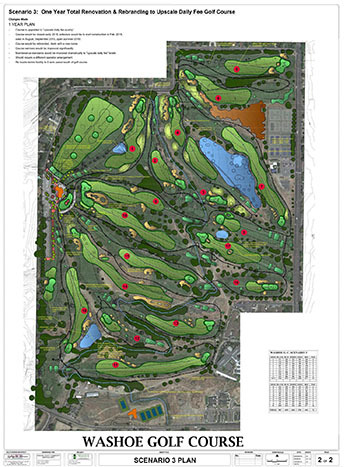 We worked with an international team of planners, taking the lead on the golf course routing and land plan parcels, which were detailed out by others. Daling Lake is on the resort island of Hainan, and included a resort hotel, and residences of several types. The golf course was routed in the valleys to maximize real estate views. Some of these valleys were on the perimeter of the course. Some on the development team wanted to move them inward to double home frontage on those holes, but it would require millions of cubic meters of earthmoving, and we convinced them it was a net gain to follow the land closely. Another project where Jeffrey D. Brauer took the lead in land planning, creating a potential of $13M in land value that didn’t exist before. After completing the basic plan, the Owner’s changed the name of the course to Tempest. 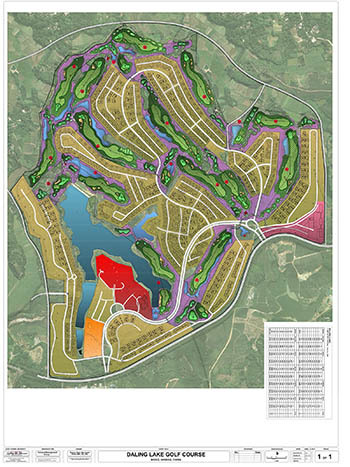 The existing course made little use of the existing land, and barely integrated housing and golf. We re-routed all but 6 of the holes, creating many high value residential lots along the new fairways, an “advertising window” of attractive holes along the major entry highway, and long vistas throughout the property. 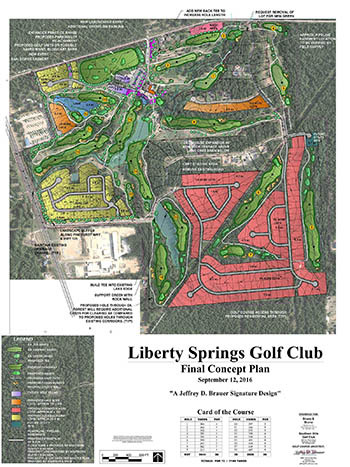 The residential mix runs from golf condos to half acre single family residences in this growth corridor in East Texas. After completing the master plan (as part of an overall golf and development business plan) we began final work on designing the golf course, which began construction in last 2016, and will open in 2018. Despite the fierce sounding name, the course should be quite playable, but not devoid of challenges! 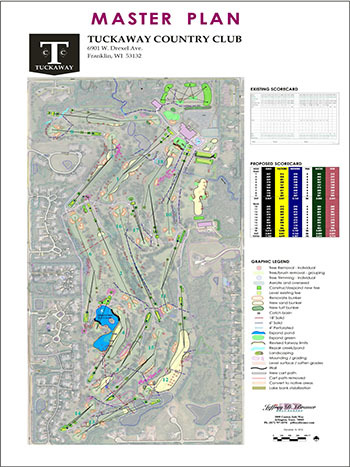 It features five sets of tees, ranging from just over 7,000 yards to about 4,500 yards, allowing every golfer “tee equity”, meaning a chance to hit all greens in regulation.